Be wary of what battles you choose to fight and where. Sometimes, the pettiness of things – and people – may just drain you completely. This morning we were caught in a traffic hold-up. Apparently, a car, some distance ahead of us, had jammed the brakes to negotiate a speed-breaker. The car right behind it, naturally could not stop in time, and so it ended up ramming the first car in the rear. The impact left an ugly dent on the bumper of the first car and a broken headlight in the car that rammed into it. Both drivers were out on the street, holding up the traffic, and pointing their middle fingers at each other. It was, as you can imagine, quite a sight. I believe, if you consider the situation on our roads both practically, and based on facts, having a “dentless” vehicle is impossible in an Indian context. The newer the vehicle, the more the chances of it “acquiring” a dent. I remember, the first time I owned a sedan, the good ol’ Maruti 1000, I had taken it for a poojaat a Ganesha temple in our neighborhood. No sooner was the arathi over, a scooterist rammed into it because his brakes didn’t work properly when he was trying to park beside my brand new beauty! I was aghast. And agitated for weeks after the incident. The second sedan I acquired, was also a Maruti, an Esteem. And I dented it while parking at a restaurant on the first day after I took delivery of the car from the dealer – I had decided to take the family out for a spin to “celebrate” the arrival of our new car! The second time I did not grieve as much. The third time I bought a new car I don’t even remember how the car got dented – but I do know it had quite a few all over! I have learnt that road rage is the biggest contributor to disturbing our peace on a daily basis. Someone cutting the lane, someone speeding past on the wrong side, someone breaking a traffic light and forcing you to slam your brakes, someone driving into you on a one-way, pedestrians darting across in your path suddenly or someone just mindlessly ramming into your vehicle – all these and more tend to make your blood boil. But expecting civility, politeness, concern for the other and respect for traffic rules, in the current Indian context, is the first and the primary reason for all our misery on the road. Just drop all expectations. 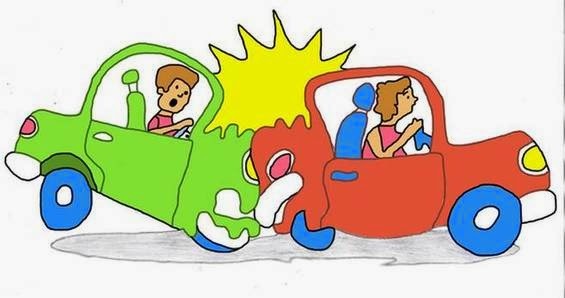 If your vehicle is damaged, and the damage is not too serious, simply drive on. Or if you must, follow the process and make an insurance claim. If your vehicle is damaged badly, make that insurance claim. Period. There’s no point wagging your middle finger and arguing with, often times, an intemperate fellow citizen! The debate, as to who was at fault, will be endless. The simple truth is there are far too many vehicles on Indian roads than what our roads are built to carry. The situation doesn’t seem to get any better. Blowing your fuse every time you use the road is only going to keep you on the edge. And each time you use the road you can be assured of either being party or witness to at least one episode of road-stupidity or an accident. So, unless you learn to keep your calm and move on, you will be hopping mad. Your hopping mad can fix no dent. Nor can it cure irreverent and insensitive fellow road users. To protect your own inner peace, you must choose your (road) battles wisely. In fact, choose none. Just take a deep breath and keep driving, or walking!